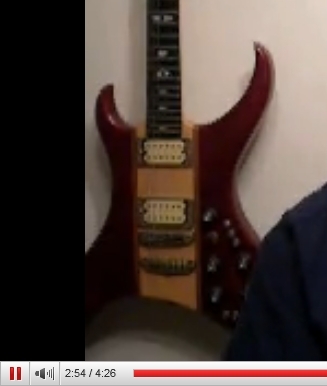 At the 2:54 mark in this video that includes a guitar as a backdrop, an MPB Today sponsor informs prospects that the company includes uplines that lie to recruits to get them to join. An MPB Today sponsor is asserting in a YouTube video that his upline is honest — but that other uplines in the company consist of liars who are “gonna tell you whatever they think you’re gonna want to hear” in a bid to get you to join the Pensacola-based multilevel-marketing (MLM) program that purports to sell groceries. How any MPB Today payments to members could be considered untainted if the company collected money based on lies and misrepresentations by sponsors was not explained in the 4:26 video. “And you’re going to see so many videos here, telling you, ‘Join us, we have a large upline, large [upline],'” the video’s narrator intoned. MPB Today is being promoted on YouTube and other social-networking sites. It also is being promoted on known Ponzi scheme forums such as ASAMonitor, TalkGold and MoneyMakerGroup. It is believed that some of the promoters have ties to the judicially declared CEP Ponzi scheme, the alleged AdSurfDaily Ponzi scheme, the alleged Pathway To Prosperity Ponzi scheme, the alleged Regenesis2x2 Ponzi scheme and other Ponzi and pyramid schemes. Ponzi ties are potentially catastrophic to MPB Today because promoters could be using criminal proceeds from other schemes to join the company. A public claim by a promoter that the company has upline sponsors who lie to members also is potentially catastrophic because it could be construed as an acknowledgment that the company is coming into possession of money based on falsehoods told by its own members. Meanwhile, some MPB Today members have posted purported “proof” videos that the company is legitimate. Some of the videos show images of checks drawn on a Florida bank that is operating under an FDIC consent agreement. At least one video shows an MPB Today member cashing a check from the MLM at an FDIC-insured bank while audiotaping the bank teller’s voice. Research suggests the affiliate’s account is at a bank in Utah. Federal officials have said that Utah is plagued by Ponzi schemes, including schemes targeted at people of faith. If MPB Today has come into possession of money from Ponzi schemes and is gathering money based on the lies of its members — and if affiliates are cashing or depositing MPB Today checks at banks across the United States — it means that banks external to MPB Today’s bank may be in possession of tainted money. The U.S. Department of Agriculture is conducting a “review” of claims about the MPB Today program. In July 2009, the U.S. Secret Service, which opened a probe into ASD’s business practices a year earlier, said it also was investigating a 2×2 cycler program known as Regenesis2x2. MPB Today also operates a 2×2 cycler. It is known that at least one MPBToday affiliate also promoted Regenesis2x2. We’ve seen companies that advertise and criticize their competition, but this must be a first when a company representative criticizes a collegue to get sales. As the “other guys” lie, is this one telling his prospective members the truth? Does he explain that it would be cheaper to buy your groceries direct from Walmart and avoid becoming involved in a scheme that will probably cause you and your friends and family to lose money and is probably illegal as well? WishfulThinking: but this must be a first when a company representative criticizes a collegue to get sales. So, at least one MPB Today member is complaining about upline liars — and another is complaining about thieves within the organization. Do they actually have an ‘illegal’ copy? What’s that old thing involving thieves, honour and a lack thereof ??? WOW! This is too much. Now we have “Dueling Video’s.” First it was “Dueling Banjo’s” and now we have moved to video. By the way, why did they call it “Dueling Banjo’s” when it was a banjo and a guitar? I was just disappointed they did not have it playing in the background. At least they showed the guitar. I think they missed a golden opportunity by not using the music. They were talking about ‘deliverance’ weren’t they? At least ASA unlocked the thread. Glad to see that Ken now has his favorite forum to showcase this best program he has seen in a long time. What members. Recruiting welfare recipients and food stamp recipients, then telling them to commit a felony by selling their food stams, then free gas on top of free food, and now liar, liar pants on fire. Just too funny! but sad for the people roped into this fiasco.